whose side are we on, anyway? I know people look for markers, patterns, SIGNS – something recognizable to help them make sense of things, and I’m aware of specifically religious end-time symbolism because my first husband was a religious scholar and we both enjoyed discussing theology, theories, and beliefs. I’m also well aware of how some devout Christians strive to distance themselves from any kind of devilry or worship of what they would consider “false gods”. That being said, I want to set the record straight on my use of the “Eye of Horus” symbolism in our dance format; as well as clarify any references I personally might make concerning the “Goddess”. First of all, the “Eye of Horus” is Egyptian, and this dance format is specifically inspired by Egyptian dancing. 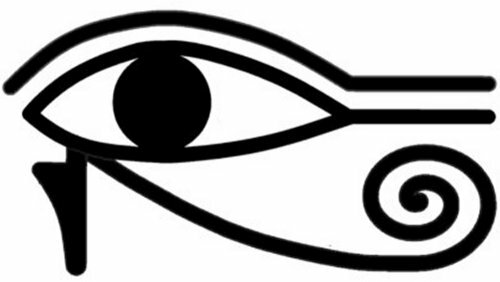 The shape of the Eye of Horus as used in our format specifically refers to the shape of our dance group in a certain situation when more than 4 of us dance together. This symbolism was first suggested by my co-creator Miramar as a way to help students remember this shape when dancing with a group. It refers to the shape of the group when the Lead Dancer is on the short side of the group. This Improv Tribal Style format is not choreographed but must be created on the spot by the dancers themselves, so any memory tricks are welcome. Secondly, use of this ancient Egyptian symbol does not signify that I promote, condone, or even permit any behaviour or rituals dedicated to Paganism, let alone Satanism, in my dance activities. In fact I actually became an ordained minister in 2002. Don’t get me wrong, I think paganism can be a positive force (at least it’s better than nothing); but it’s not what I’m about, nor is my dance art about that. When I personally lead a pre-performance circle before a show I quite clearly invoke, by name, the Creative Spirit, a Divine personality. How old-school, to be sure! Third: in the end what counts is MOTIVATION – that is, what is really in someone’s heart when they wear or use a symbol. People may be fooled by appearances, but the Spirit is not. For instance, if I don’t know any better than to worship a God who has human emotions like anger, that’s fine. But if I know better than that and I still pretend to believe in it – that’s not okay. My religion is of God, but don’t expect me to put my new wine in any of your old wineskins. And now, enter the GODDESS. I use imagery that speaks to me – and the attributes of nurturing care and planning that females bring to the table are best personified to me on a universal level by the concept of the Goddess, our Mother Spirit, a complement to the seed of our Universal Father, God. Just two aspects of the trinity deity we come from, move in, and can return to. Since our finite minds are far from being able to understand, let alone explain these concepts of infinity, the familiar concept of the Goddess stands in as a sort of mental shorthand that gives us dancers an image of inspiring feminine spirituality. It’s as far from a false god as you can get. Sometimes I have to remind myself that often what other people see is a mirror of what they have in their minds, and is not really about me at all. But in any case, now this is as clear as I can make it. If you don’t understand this or have any questions, please feel free to ask me.